A new Boston University study shows children under the age of 12 who play tackle football have a greater risk of health problems later in life. Playing tackle football under the age of 12 is now linked to a greater risk of health problems later in life, according to a new study from Boston University researchers released Tuesday. This study focused on kids under 12 with repetitive hits and the damage researchers say is affecting them throughout their lives. It is child’s play morphing into an adult problem. “I was really concerned”, said Dr. Robert Stern, who is one of the leading researchers. “This study showed starting tackle football before age 12 seems to increase the risk for later life problems, " Stern said. The study found repetitive head impacts, not concussions, before age 12 doubles the risk of behavioral problems such as moodiness and apathy. They also found it triples the chance of suffering from depression later in life. Doctors say age 10-12 is a key time for boys still developing their brains. They found the younger the players are when starting to play tackle football, the greater risk of those behavioral problems later in life. “Every time the body or the head gets hit and the head moves quickly, the brain gets sheared and stretched. It’s not those big hits and having symptoms and diagnosed with concussion. We are talking about the many hits per game and per practice without feeling anything from it,” Stern said. "The participants in this study played youth football 40 years ago. 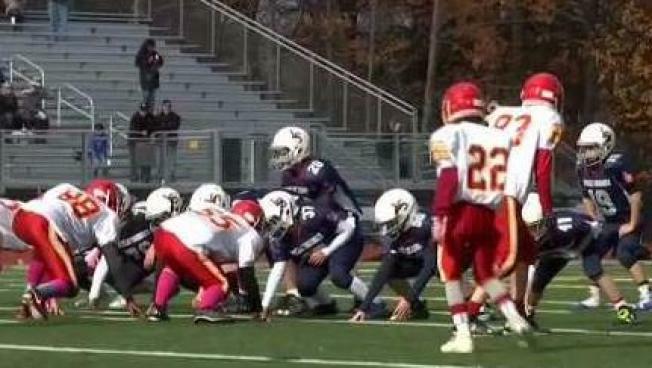 Youth football has evolved significantly since that period and the major changes Pop Warner has implemented have revolutionized the sport, making it safer and better than ever before. It has been suggested that selection bias calls into question the conclusions of this study. Still, our medical advisory committee will review it and compare it against the number of recent studies that contradict these findings. The greatest evidence against this study may be the millions of successful individuals who played youth football and went on to become leaders in society as teachers, doctors, police officers, business owners, CEOs, judges and journalists." The Boston University study found that kids under the age of 12 take an average of 250 hits per season. Another study at Wake Forest University found kids under 12 with no concussions, just repetitive hits, had changes in the white matter of brain in just one season of youth football. Researchers looked at 214 former football players who began playing before age 12 and played only through high school or college. The average age of the study participant was 51 years old.